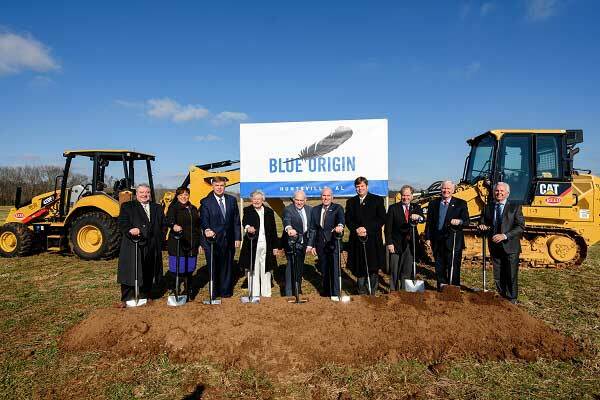 HUNTSVILLE, Ala. (Huntsville/Madison County Chamber PR) – Blue Origin celebrated the official groundbreaking for its world-class rocket engine production facility on Friday in Huntsville. 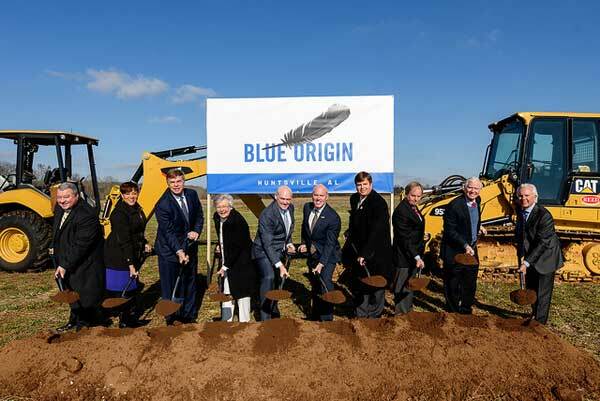 HUNTSVILLE, Ala., January 25, 2019 (Blue Origin PR) — Today we broke ground on the construction of a world-class rocket engine production facility in Huntsville, Alabama, extending the city’s rich legacy in liquid rocket engines. It’s a great day here in Rocket City. Thanks to the votes of confidence from United Launch Alliance, from the Air Force for national security missions, and from Huntsville and the state of Alabama, we are breaking ground on a facility to produce our world-class engines and power the next generation of spaceflight. Centennial, Colo., Sept. 27, 2018 (ULA PR) – United Launch Alliance’s (ULA) next-generation rocket – the Vulcan Centaur – is making strong progress in development and is on track for its initial flight in mid-2020. The Vulcan Centaur rocket design leverages the proven success of the Delta IV and Atlas V launch vehicles while introducing advanced technologies and innovative features. 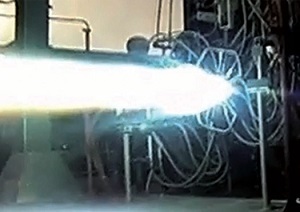 Space News has an update on Blue Origin’s development of its BE-4 engine. The chief executive of Blue Origin says he expects the company’s BE-4 engine to complete qualification testing by the end of the year as the company ramps up work on its New Glenn orbital rocket. In an April 19 interview during the 34th Space Symposium here, Bob Smith said testing of the BE-4 engine, which uses methane and liquid oxygen propellants, was going well as the company stepped through a methodical process of increased durations and thrust levels. “We continue to progress along the lines of changing the power levels and going from various throttle settings,” he said. That includes, he said, a test the company announced in March when the engine fired for 114 seconds at 65 percent of rated power. That duration is about half a typical mission duty cycle for the engine. Ben Brockert says this means two big gas turbines exploded. 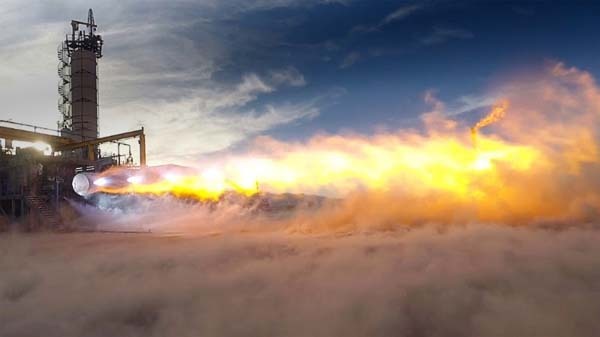 In what is likely a surprise to no one, United Launch Alliance’s CEO said this week the company is leaning toward selecting Blue Origin’s BE-4 engine in the first stage of its new Vulcan rocket — providing upcoming engine tests go well. That would leave rival Aerojet Rocketdyne and its AR1 engine without a booster to fly on. In an interview during the 33rd Space Symposium here, Tory Bruno said that tests of the BE-4 engine, scheduled to begin “very soon” at Blue Origin’s test site in West Texas, are the last major hurdle the engine must clear before ULA decides to use it on Vulcan. Although the BE-4 turbopump is smaller than your refrigerator, it generates 70,000 horsepower from a turbine running at nearly 19,000 revolutions per minute that pumps cryogenic propellants to pressures just under 5,000 pounds per square inch. 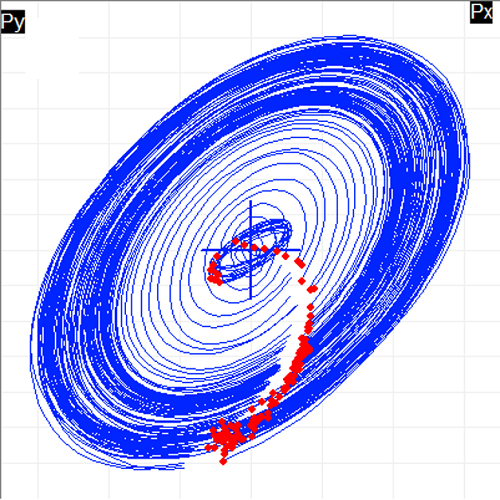 To react the forces generated by the rotating turbine and impellers inside the pump, production rocket turbopumps to date have used traditional ball and roller bearings. For BE-4, we’re doing something different – we’re using hydrostatic bearings. Blue Origin’s Jeff Bezos is expected to announce something on Tuesday in a speech at the Satellite 2017 conference in Washington, DC. 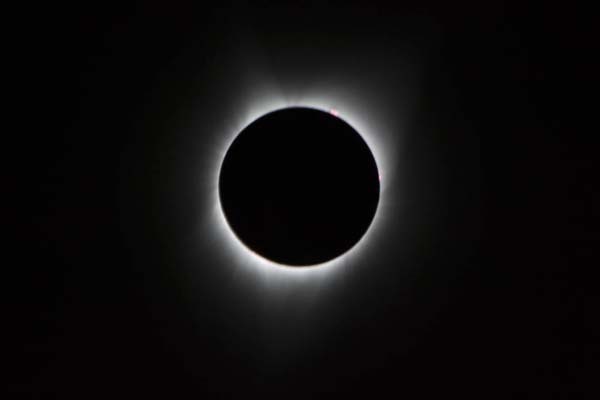 I’m guessing it will be an elaboration on the company’s plans for establishing a base at the south pole of the moon. 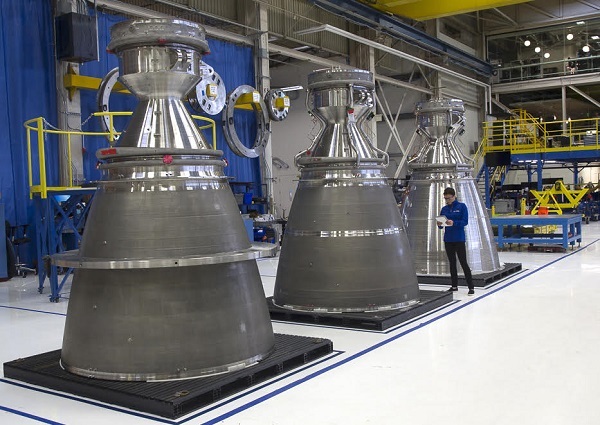 He also will likely provide updates on the testing schedule for the BE-4 engines (pictured above), development of the New Glenn booster, and construction of the company’s manufacturing facility in Florida. Robert Goddard’s first rockets used compressed gas to force the liquid propellants into the engine thrust chambers. While simple in design and a logical starting point, he quickly realized the limitations with this approach: it requires thick-walled heavy propellant tanks and limits the engine’s chamber pressure and performance, both of which limit payload capacity. The answer was turbopumps. 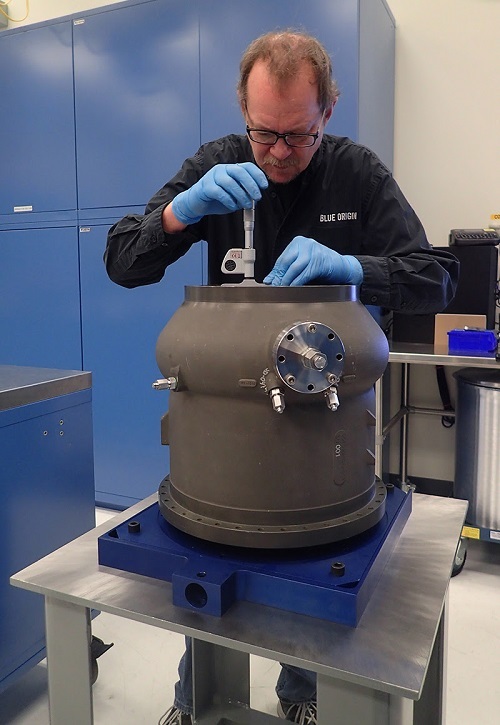 Store the propellants in low-pressure light tanks, and then pump the propellants up to high pressure just ahead of injection into the main chamber. For even more performance, you can add one or more boost pumps ahead of the main pumps. We’ve done that on the oxidizer side of our BE-4 engine. Our Ox Boost Pump (OBP) design leverages 3-D additive manufacturing to make many of the key components. The housing is a single printed aluminum part and all of the stages of the hydraulic turbine are printed from Monel, a nickel alloy. This manufacturing approach allows the integration of complex internal flow passages in the housing that would be much more difficult to make using conventional methods. The turbine nozzles and rotors are also 3-D printed and require minimum machining to achieve the required fits. The OBP was first demonstrated last year in testing, where we validated its interaction with a main pump. The second iteration of the OBP for BE-4 is now in test. We’ve also just finished assembly of the unit that we’ll install for the first all-up BE-4 engine test. We’ll keep you posted on how our BE-4 powerpack and engine testing progresses.